1. How did you become part of the IMTBIKE Family? Through a partner of “Paradores” where I worked previously for 10 years. She let me know that IMTBIKE was looking for someone in the Booking Department for travel reservations and it was then that I met Scott and Isabel. 2. What do you always take with you on a tour? A small guide travel book made by me. I’m passionate about art. 3. What do you like to eat for breakfast when on a tour? I love breakfasts I don´t usually have at home: eggs, bacon, cheese, omelet, etc. And of course, freshly squeezed orange juice. Paradores actually offer my favorite breakfasts. 4. Do you have any rituals before starting a tour? I always make a list of all the things I need to take in the suitcase. 6 . 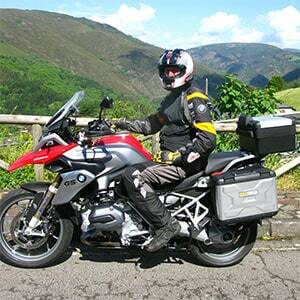 Of the trips you´ve prepared with IMTBIKE, Which one would you like to do? I truly love all of them! But if I had to choose … Provence & Tuscany or Sardinia & Corsica would be my choice. The Parador in Jaén (Castle of Santa Catalina) has a ghost in room 22. Apparently, one night a client woke up by the sound of knocking on his door and the voices of a woman. In 1984 a team of parapsychologists studied the place and came to the conclusion that these voices could not be of someone else other than a young lady who died of lovesickness centuries ago. 8. What it´is your favorite food? 9. What do you like doing most in your free time? 10. If you could meet anyone, dead or alive… who would it be? 11. What do you think is the invention of all times? 12. If you could be an animal, what would you be? A Tiger, my favorite animal along with the dog. 13. If you had a time machine where would you go? To Ancient Egypt and Ancient Rome. 14. Who do you consider to be the best band/singer in today’s music? 15. What do you do on a rainy day? 16. What´s your favorite ice cream flavor? 17. What do you think about when riding a motorcycle? I have not ridden a motorcycle for a long time, but it gave me a feeling of total freedom and adrenaline. 18. What do you want to be when you grow up? Flying and also the power of Healing (especially towards my loved ones). 20. What country would you like to visit soon?